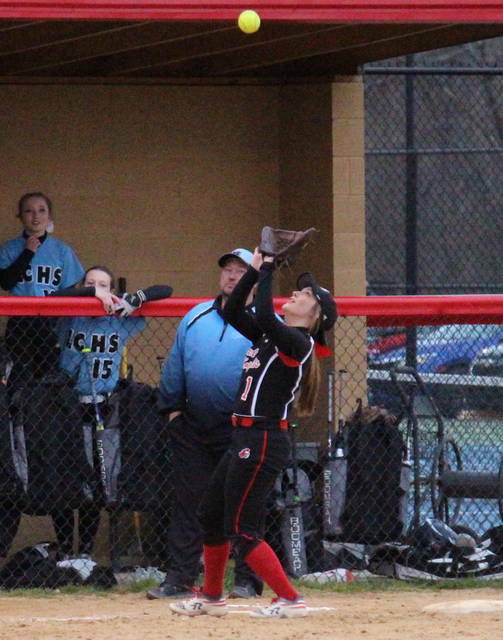 PPHS senior Lila Beattie hauls in a flyball during the Lady Knights’ 8-0 loss to Lincoln County on Monday in Point Pleasant, W.Va.
POINT PLEASANT, W.Va. — No offense, no hope. 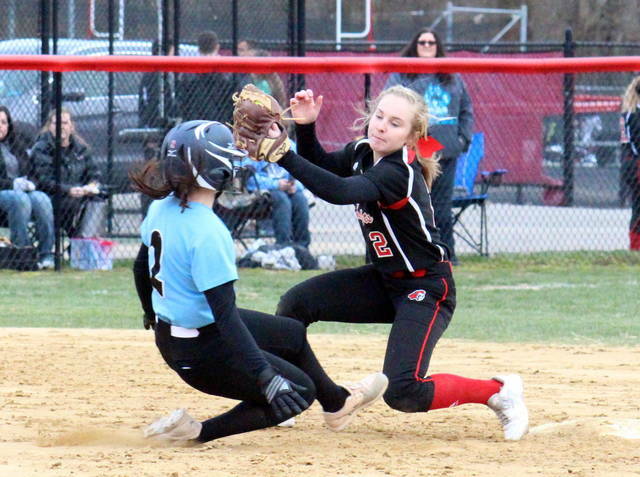 The Point Pleasant softball team only made it into scoring position in one inning on Monday in Mason County, as the Lady Knights fell to visiting Lincoln County by an 8-0 count in five innings of play. Consecutive singles to start the game gave the Lady Panthers (1-5) a 1-0 lead, with the guests bringing home another run later in the frame. Point Pleasant (4-2) stranded a runner on first in the opening frame and then committed three errors in the top of the second, helping LCHS extend its lead to 6-0. The Lady Knights loaded the bases with two-out rally in the bottom of the second, but a flyout to the right fielder ended the inning. After a pair of scoreless frames, the Lady Panthers added two runs on two hits and one error in the top of the fifth. The Lady Knights failed to answer in the bottom half of the frame and fell by an 8-0 count. 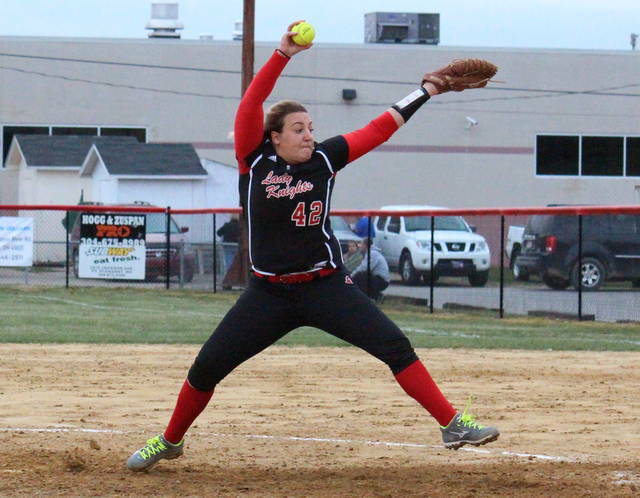 Leah Cochran suffered the setback in four innings of work for PPHS, allowing eight runs, three earned, on eight hits. Cochran struck out three batters, walked one, and hit one. Peyton Jordan pitched in relief and retired all-3 batters she faced. Bailey Pullen earned the win in a complete game for the guests, striking out two, walking two and allowing five hits. At the plate Peyton Jordan, Tanner King, Izzy King, Shala Swain and Hannah Smith each singled once for the hosts. Pullen, Rachel Pennington and Koree Roberts had two singles apiece for the guests, while Natalie Fout and Randa Watts both marked one hit. Pennington marked game-highs of two runs scored and three stolen bases. Fout, Koree Roberts, Amber Roberts, Elizabeth White, Brooklyn Salmond and Aly Layne each scored once, while Pennington, Fout, Koree Roberts and Amber Roberts each had an RBI. PPHS was responsible for all-4 of the game’s errors and left six runners on base, two more than LCHS. These teams are slated to meet again on April 7 in Lincoln County. 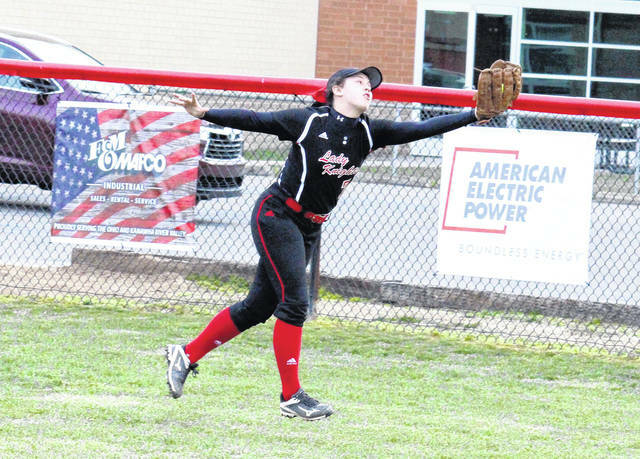 The Lady Knights are scheduled to be back on their home field on Wednesday against Winfield.